heck YEAH! and they're both westys?! very good score. 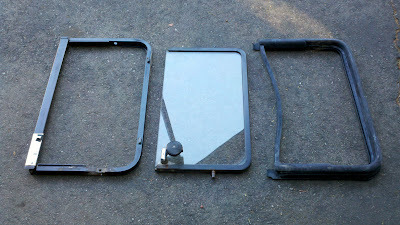 Does anyone know where to get the metal frame that the "side vent" aka wing window on an early/ late bay sits inside of? I can get the rubber easy, but my frame is rusty. That thing is probably worth half that... all the work that needs to be done, the rust, what color is it even? If it was yellow, the interior isn't OG. Jeez, CT... Can't you read? It says right in the ad, "This bus will sale fast so don't waste time. This is for a Vw Bus enthousiast. Not a bigginer." It's going to sale fast, so hurry up and buy it. It's a good think you're not a bigginer. I think it's worth more like one-third the list price. It's put together like a Harlequin bug. And if it ran when parked last, why do you have to bring a trailer to pick it up? Hmmm.... It's a Canadian conspiracy. Did you intend to put this in the whines thread? or a wedding photo booth business. FREE VW bus front end. I don't know the year, but might make a good piece of art. Call me to pick up any time. i think wolfsbergwest sells them now or busdepot you can get the complete vent. "asking and getting are two different things"
BUT it is a Westy and a '75, so NO SMOG check required in California! That is almost half the price I paid for a set of five a year ago. I kinda think chrome yellow looks mighty nice, but I may be jaded. Nice solid platform, but even without rust there is quite a lot of bodywork there - not to mention interior work, no motor - shouldn't it be listed more like half that price? Yup, $3500 sounds like a good starting price. But it will probably sell for much less than that. Well, like you said it definitely has a lot going for it being in Cali and smog exempt - but yes, gonna need a lot of time and money whoever buys that! just picked up a set of 4 on amazon prime for $320 - delivered!! BAM! Obviously this guy hasn't been monitoring The Samba for prices and availability of type IV engines. He's willing to pay $500 for a working engine with fuel injection. Well, heck.... I'll go as high as $600!